Photograph courtesy Danny Preston, collection Neil Johnson 25274 at Manchester Victoria on September 17th 1981. The sixteen year career of D7624/25274 started out on the Eastern Region, transitioned to the Western Region before moving to the London Midland Region for the remainder of its career. Boiler room grilles sheeted over. August 1967 to Leeds Holbeck (55A) initially on loan but then made permanent. November 1970 to Newport (86B). 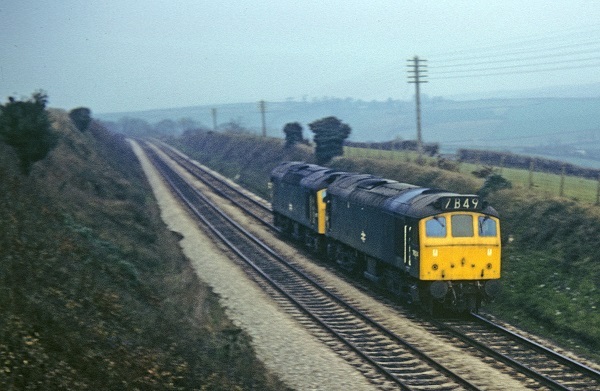 December 1972 to Laira (84A). May 2nd 1982 - withdrawn. 25274 was the 128th Class 25 withdrawn, leaving 199 remaining in service. After almost seven years allocated to Bescot 25274 was retired and moved to Derby Works. On February 4th 1985 25274 joined a convoy of withdrawn locomotives being moved to Swindon Works for scrapping, which for 25274 took place by the end of April 1985. Noted Derby Works January & February 1975 (accident repairs, ex-works). Noted Derby Works January - March 1980, intermediate repair. 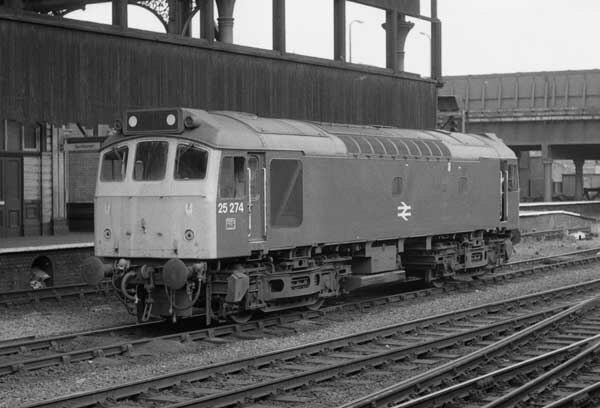 D7624 was the first of thirty five Class 25s to be built by Beyer Peacock. Delivered new with blanking plates fitted? 25274's recorded passenger workings were not that prolific and very much run of the mill, particularly after its allocation to Bescot. It made the familiar trips to Skegness, Norwich (for Yarmouth), Barmouth, Aberystwyth, Llandudno & Blackpool. On July 17th D7624 & Stanier 5MT 4-6-0 No.45206 doubleheaded Heysham - Neville Hill (?) oil tank train. Condition July: green livery with small yellow warning panels, exhaust in original location. Photograph courtesy Geoff Coward. The end for standard gauge steam on British Railways is less than a month away as a faded and work stained D7624 draws alongside one of the few remaining active steam locomotives at Carnforth sometime during a pleasant day in July 1968. Three railway staff pass the time of day, busy in some sort of conversation. On June 11th the 10.20 Bournemouth - York SAGA special was worked forward from Birmingham New Street by 7624. Photograph courtesy Roger Geach 7624 & 7677 at Moorswater on Saturday March 17th 1973 running light engines from St Blazey to Plymouth. On May 15th the 20.40 Exeter St. Davids - Newton Abbot was worked by 25274. The Barnstaple - Cheltenham Spa return leg of a day excursion was worked to Exeter St Davids by 25274 on August 4th. Noted during October with no blanking plates fitted. Collision damaged 25274 was towed from St Blazey to Bristol by 50018 on January 2nd. Later the same day it was noted en-route to Derby Works with two Class 46s (one being 46053) and 08668 & 08937. Ex-works 25274 was noted at Northwich depot on February 23rd, presumably trying to find a way back to its home shed of Bristol. A diesel multiple unit failure on July 29th saw the 15.16 Newquay - Plymouth assisted from Par by 25274. On Sunday August 10th the St Austell - Worcester motorail was worked by 25274 & 25275 to at least Plymouth. On February 28th the Tyne - Kings Norton carflats was worked by 25271 & 25274. The 10.07 Aberystwyth - Euston was worked from Shrewsbury to Wolverhampton by 25274 & 25039 on September 4th. On April 12th the electric multiple unit working a Walsall - Birmingham New Street was assisted forward from Bescot by 25274. On September 4th the 08.45 Birmingham New Street - Barmouth was worked to Shrewsbury by 25274 & 25263 returning later in the day from Shrewsbury with the 17.30 Barmouth - Birmingham New Street. The 08.00 Walsall - Yarmouth to Norwich and the return 14.15 Yarmouth - Derby from Norwich were worked by 25274 & 25248 on July 15th. On July 1st the 08.45 Birmingham New Street - Barmouth and the return 17.45 Barmouth - Euston to Wolverhampton were worked by 25274 & 25263. The 10.10 Euston - Aberystwyth from Birmingham New Street and the return 16.10 Aberystwyth - Shrewsbury were worked by 25274 & 25195 on August 25th and by 25274 & 25141 on September 15th. On September 16th (a Sunday) six coal trains were worked from South Wales to Corby. Four of the coal trains were held at Didcot and two at Oxford, with Banbury providing locomotives to work the trains forward to Corby. 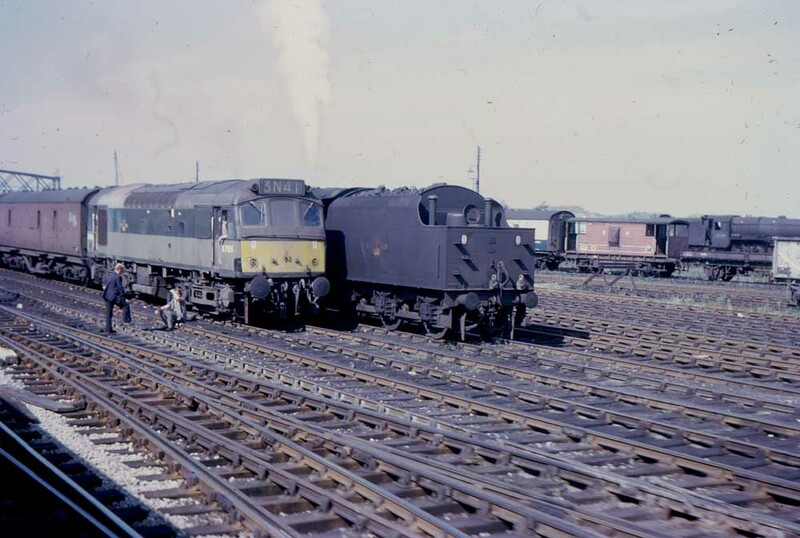 Two pairs of Class 25s were used, 25141 & 25274 and 25134 & 25212, other types included Classes 20 & 47. On May 24th the 08.02 Walsall - Yarmouth to Norwich and the return 14.15 Yarmouth - Derby from Norwich were worked by 25274 & 25248. The next day (25th) the same pair worked a roundtrip Leicester - Skegness passenger diagram. The 18.35 Birmingham New Street - Norwich was worked by 25274 on July 5th. A week later on July 12th sisters 25274 & 25275 worked the 10.10 Euston - Aberystwyth from Birmingham New Street, returning with the 16.10 Aberystwyth - Shrewsbury. On July 19th the 04.10 Shrewsbury - Aberystwyth and the 10.07 Aberystwyth - Euston to Wolverhampton were worked by 25274 & 25263. The next day (20th) the same pair were noted on the 08.45 Birmingham New Street - Aberystwyth to Shrewsbury(?). On September 1st 25274 worked the 16.42 Llandudno - Crewe, two days later (3rd) it worked the 13.40 Manchester Victoria - Llandudno Town. 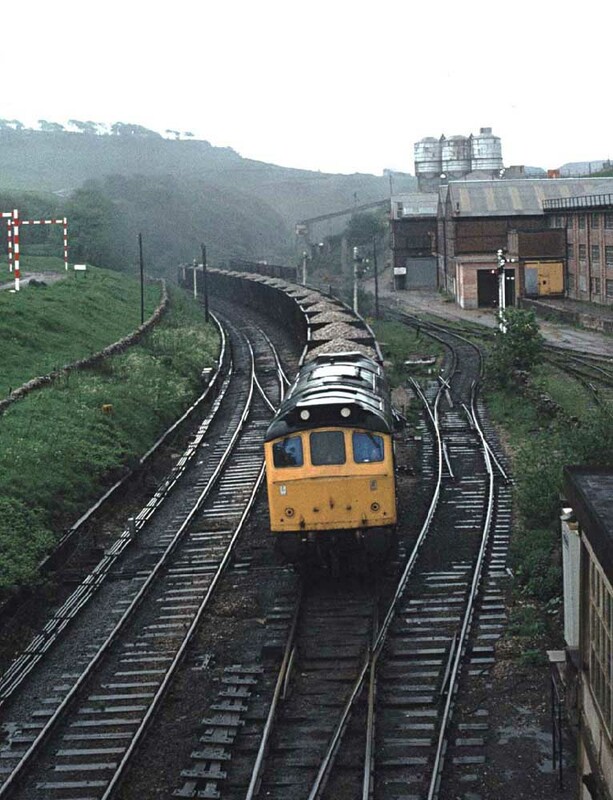 Photograph courtesy Tony Sayer Its a damp day in Derbyshire as 25274 & 25308 get to grips with another trainload of limestone for the Northwich area, seen here passing Great Rocks on May 26th 1981. The 21.13 Manchester Victoria - Blackpool North was worked by 25274 on June 9th & 13th. On August 22nd the 08.35 Derby - Yarmouth to Norwich and the return 14.20 Yarmouth - Derby from Norwich were worked by 25274 & 25280. Three days later (25th) an Ealing Broadway - Skegness day excursion failed behind 47147 near Burton-on-Trent, 25274 & 25280 dragged the service to Nottingham where 45049 took over. The 08.35 Derby - Yarmouth to Norwich and the return 14.20 Yarmouth - Derby from Norwich were worked by 25274 & 25323 on September 5th. The next day (6th) the same pair worked the 08.21 Leicester - Skegness and the 18.30 Skegness - Leicester. 25274 was withdrawn from service on May 2nd 1982. The service life of 25274 after its last Classified repair was only 26 months, its unclear whether it suffered a major failure or whether there was a surplus of vacuum braked Class 25s at this time. Photographer unknown Almost brand new D7624 at Washwood Heath (?) during the summer of 1965. Formed by a partnership of Charles Frederick Beyer (1813 - 1876), Richard Peacock (1820 - 1889) and Henry Robertson (1816 - 1888), the engineering firm of Beyer, Peacock Ltd, Gorton, Manchester produced nearly 8,000 locomotives between 1855 & 1966. Gorton Foundry was located at Openshaw on the south side of the railway line opposite to the Manchester, Sheffield and Lincolnshire Railway works at Gorton. Steam locomotives were the mainstay of Beyer Peacock's production, with a total of 7,853 built. 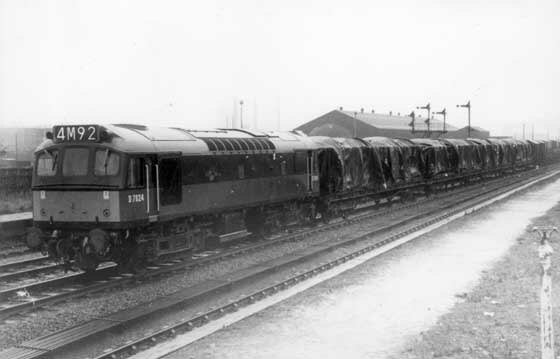 The transition to more modern forms of traction came too late for Beyer Peacock, although some orders were recieved (see below), they were not enough and so similar to several other renowned British locomotive manufacturers, production ceased and the workshops closed during the 1960's. Although Beyer-Peacock did not complete all of its Class 25 order, it did create the Builders Plates for those locomotives transferred to Derby Works. These Builders Plates were transferred to Derby, but obviously were never used. last updated April 2nd 2019.